Dalvik is the virtual machine that is used by Android. It is generally thought of as a java virtual machine, although this is not precisely correct. It uses an object model that is identical to java, and it’s memory model is also nearly equivalent. 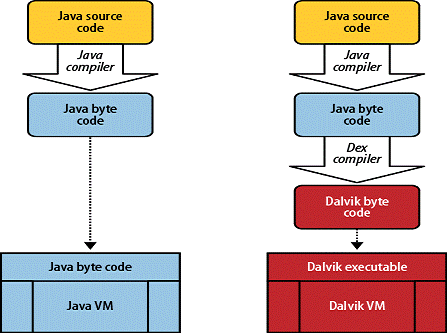 But the dalvik VM is a register based VM, as opposed to java VMs, which are stack based. Accordingly, it uses a completely different bytecode than java. However, the Android SDK includes the dex tool to translate java bytecode to dalvik bytecode, which is why you are able to write Android applications in java. ART is an application runtime environment used by the Android mobile operating system. ART replaces Dalvik, which is the process virtual machine originally used by Android, and performs transformation of the application’s bytecode into native instructions that are later executed by the device’s runtime environment. Unlike Dalvik, which since Android 2.2 “Froyo” uses just-in-time (JIT) compilation to compile the bytecode every time an application is launched, ART introduces use of ahead-of-time (AOT) compilation by performing it upon the installation of an application. By reducing the overall amount of compilation that needs to be performed across the operation of an application, a mobile device’s processor usage is reduced and battery runtime is improved. At the same time, ART brings improvements in performance, garbage collection, applications debugging and profiling. Apache ant is a generic build tool. The name ANT stands abbreviated for ‘Another Neat Tool’. This tool is similar to the ‘Make’ utility in UNIX but is implemented using Java. It is primarily used for building the binaries of a java based source code and deploying the generated binary to an application server which is predefined. It can also be used to generate javadocs for a code base and to execute the unit test suite for the whole codebase. Ant in collaboration with JUNIT helps developer to follow the test driven development approach. Ant requires Java compiler to be installed having the environment variable JAVA_HOME set with its adequate value. Ant uses an XML file to define the build procedure. The default name of this file is build.xml. Some developers also use a properties file namely build.properties to define some properties e.g. the build version number and other environmental parameters which are required to change from time to time based on the need. This article will be updated periodically. And please feel free to comment the words you like to get some explanation so I can update this article with them. Jenkins is not directly related to Android. Still as someone asked its explanation I am sharing a small description I found on the internet. Jenkins is an open source continuous integration tool written in Java. The project was forked from Hudson after a dispute with Oracle. Jenkins provides continuous integration services for software development. It is a server-based system running in a servlet container such as Apache Tomcat.